Lynne is a Registered Acupuncturist and began her interest in health care after being hit in the eye and head by the length of a 5/8 inch thick, 60-foot long chain and hook. This was the beginning of many years of massage and chiropractic treatments, leading to her become a Certified Massage Therapist (US), later learning Reiki, Neuromuscular Therapy, Reflexology, CranioSacral Therapy, tuina, acupuncture and Chinese medicine. She also practices Mei Zen cosmetic acupuncture and is a certified Low-Intensity Laser Therapy practitioner. She worked in the music business for twenty years as a touring massage therapist, wardrobe manager, set carpenter and lighting technician for bands such as U2, REM, Bon Jovi, Kiss, Celtic Woman, the Cranberries, Gloria Estefan, Savage Garden, David Byrne and others. 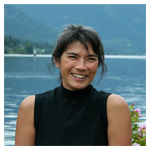 She graduated from The Academy of Classical Oriental Medicine in Nelson, BC, The Boulder College of Massage Therapy in Colorado, The University of South Florida and is licensed as an acupuncturist in B.C., and an herbalist and acupuncturist in the US. She has been a volunteer acupuncturist at Bumi Sehat, an acupuncture and birthing clinic in Ubud, Bali, and at Cecali, a natural medicine center in Esteli, Nicaragua. Lynne enjoys treating the TMJ and back, combining bodywork with acupuncture, and teaching people about health. If you would like to book a treatment with Lynne, call 250-833-5899 or book online.